As the local police continue the investigations into the gun smuggling ring and seize weapons in other operations locally, they have been able to directly link a number of the guns to specific crimes and suspects, assisting with ongoing court cases as well as investigations into the more recent spate of fatal gang shootings in September. Over the last few years customs officials and police in Cayman have intercepted at least three shipments of firearms that the Florida based ring of smugglers sent to Cayman, including weapons found in air conditioning units, a toy car and the refrigerator case, which led to the latest arrest of Brandon Leslie (aka Mykkle Ebanks) in the US. Baines said that the RCIPS was aware of other weapons purchased and smuggled by the people involved in this ring and cooperation between the US agencies and the RCIPS in this case had been important. He said there could have been as many as seventeen guns getting through packaged in containers among appliances and other goods but the police had already recovered several of them, which would be revealed in forthcoming cases, and they were confident of seizing more. Earlier this month Robert Terry received a twelve year sentence for possession of one of the weapons that was smuggled in by the ring and more recently another of the guns has been linked to five different crimes. The senior officer explained that in the wider pursuit of those individuals responsible for the gun smuggling between America and Cayman local police have worked in conjunction with the Alcohol, Tobacco and Firearms (ATF) agency to use information to identify where the best location to prosecute would be. He noted that when Leslie was successfully prosecuted here for murder and serving a life sentence the cooperation between the law enforcement agencies switched to other priorities. However, following his release on appeal, the RCIPS informed the US authorities that he was returning to Florida, enabling agents from the ATF to reactivate the existing warrant based on evidence that had been collected in the States. “Our relationship with the United States in the fight against firearms smuggling is crucial,” Baines told CNS. He explained that it went beyond this particular smuggling ring to sharing intelligence on the trends in the region of how weapons and drugs are being moved around and how all Caribbean law enforcement agencies can best use their resources to tackle what is becoming a serious problem. He added that the RCIPS has a fast track access to the ATF data-bases and can trace where weapons seized in Cayman originated and in some case where they were purchased and by whom. The recent boost to police resources, following the decision by the Legislative Assembly to reinstate the RCIPS budget, would allow the police to focus even more on border control and gun smuggling, Baines said. With hundreds of containers coming into the islands, the intelligence gathered through cooperation with American authorities and regional police forces will help his officers and the customs department to use both existing and new resources, such as the scanner and specially trained dogs, more effectively. Baines explained that the cooperation helps local agencies hone in on the containers more likely to be used by smugglers, and to pick up on illogical or irregular behavior when it comes to shipping patterns. The scanner, he said, would be able to detect firearms no matter what appliances the smugglers chose to hide their contraband in. Cayman’s most senior officer spoke of the hemorrhaging of weapons from the US into the Caribbean, which he said was a consequence of the clamp down on the drug trade across the Mexican border. “If you squeeze the balloon in one place it pops up somewhere else and it’s currently the Caribbean,” he said, warning that there could be worse violence on the horizon as the exceptionally profitable and inherently more violent cocaine trade shifted into the region. Even where weapons are not recovered or where an arrest may not occur because the smugglers are able to make an escape, Baines said the fact that the guns have gone over the side of the canoe and have not made it on to the streets of Cayman can be counted as a success. Acknowledging the serious local gun problem, Baines noted that it was still evident that the country is not yet awash with firearms. 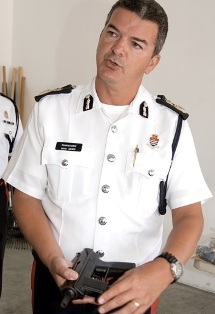 He pointed to active gang members being seized recently with weapons that, although functioning, were faulty and posed a threat to the user, as well as opposing gang members sharing weapons and homemade flare gun conversions being seized that would be extremely dangerous to the person firing them, illustrating that it is still not so easy to acquire a gun in Cayman. The commissioner told CNS that the RCIPS is far from complacent about the problem and was now heavily focused on gathering intelligence and ensuring the best use of resources to stop the guns getting in. See warrant filed in Florida court on US-Cayman gun smuggling below. The commissioner sure has a tough job! Maybe the reason that none of them last very long on the job, is because we critize everything that they do, or say. Yet we expect them to protect us. It really is a no win situation for the top guy. I mean, who amongst us is willing to take so much criticism just to hold unto a job? 16:11 you got my thumb up. Have you noticed how more critical we have become, on just about everything. No appreciation no consideration no thanks. While we point our fingers at the people who come here to try and clean up our mess, that WE have created. I want to wish you all a Merry Christmas and a less critical new year. 13:13 & 13:21. End of story. That boy is a handsome Caymanian boy. He is not a 'Passport' Caymanian but one of those Caymanians to the bone. I personally know his grandma who is such a decent Caymanian woman. Which handsome boy you talkin about??? I don't think that was at issue. The part of this article that leaves me wondering is, "Over the last few years customs officials and police in Cayman have intercepted at least three shipments of firearms." For "the last few years", that doesn't sound like much. Can we have some real numbers? Exactly how many firearms were in those "at least" three shipments? That's a question people have asked before over and over again but we just get vague comments like 'several', 'numerous', 'a quantity of', 'a number of' or 'a significant number of'. Allof which suggest a deep-seated reluctance to tell the public exactly what is, or more likely isn't, going on. Why? Have they proved to be a security threat to us? How does a visa requirement mean that you are a presumed criminal? I'm an American who has been here almost ten years. Would you like to see my Police Clearance? An amazing discovery by the RCIPS. On which planet to they in fact live? Now that they know this, they should also be able to stumble upon a solution. Let us invite our good citizens to arm themselves with LEGAL guns? to the same standard of any gun-carrying policeman. Then deputized. Crime on Cayman would necessarily die overnight, because the game would be over . As i read this article it dawn on me that someone or should i say some people are trying to put the spin on a disasterous year for the RCIPS. This sounds almost as wonderful as Dart putting a cap on the GT dump? If you read this expose with all the intelligence goodies and tidbits which quite obviously did not transform into the solid cases or "successful prosecutions" as they put it. Which by the way means, it can stand up to any subsequent appeals by those charged and convicted my good man! I like how reference is made to the HM Customs officers who's diligence and vigilance alone led to all three of these excellent weapons seizures and by refering to them as "law enforcement agencies " does a great disservice to those same said officers efforts. It also gives the impression that they were being led by our highly over paid specialist in the RCIPS to make these seizures which is obviously and was not the case. NIce try though! There has always been a very strong relationship the the US authorities long before some who have turn up here and tried to reinvent the wheel all over and others who's jealousy and troubling positions and connections and hidden agendas have tried to destroy and dismantle this same well established and historical mutual friendship between the US and Cayman. What a pity? I find it hard to believe that the recent Compass editorial came from reading the same document. Truly amazing!!! More than once Jamaica was blamed for these illegal guns in Jamaica. More than once I refuted that scandal. Jamaica has it own problems and need all their guns in Jamaica. What has that got to do with the article? If you mean that guns are smuggled in from Jamaica then obviously this news story does not in any way disprove that and there is plenty of evidence in favour of that. Because guns were found to be smuggled in a fridge from the U.S. does not mean that this is then the sole source of guns in Cayman. What about the fishing boats that fish on the Hunduran fishing banks? aren't they able to drive right into the canals without Customs and Immigration checking them first…this happens everyday. Where are our coast guards? we have patrol boats that the customs and Immigration shares use of , but they sit on dry land 90% of the time. I'm sure it was a Jamaican that introduced Caymanians to the gun stores in Miami 🙂 Its never our fault. Indeed we are perennial victims – in our own minds. This gun smuggling is one of the most serious crimes against the Cayman people and those involved should be dealt with to the full extent of the law. No fooling around with these people. Then Caymanians should stop smuggling guns in from Miami. You mean criminals should stop smuggling guns from Miami. Don't try to tar every one with the same brush. What part does our Immigration play in this intelligence…none. they need to focus more on home land security and stop wasting time the playing employment agency. we are so f@@@g backward in this country. Where is the finger printing we were promised. lets finger print all that passes through our system.. Caymanians and all…they seem to surpass the foreign criminal. why do we have to drag our feet like some retards. It's customs, not immigration or the police, that looks for guns in containers. I mean, how truly shocking is this expose. Wow! We should send all our criminals to the USA for prosecution because our system apparently doesnt know how to or doesnt want to…….and all the murderers, armed robbers handlers of illegal weapons, druggies and drunk drivers etc. get a little staycation in Northward and then get released to reoffend here and in other countries!!!. Our young people notice this and have no incentive not to follow the same path. Our young people need to be taught that bad choices come with bad consequences and that having a criminal record destroys any hope of a productive future, therefore what is the point of releasing them back into society where they cannot get hired and cannot get accepted into most schools???? Prosecute them and lock them up for life here where the world doesnt see on the front pages of their newspapers that we have a serious crime issue here. All Cayman needs is a smart prosecutor…lets get one from the USA on a short term basis. What we have been getting here, are lawyers using the judicial system to get into private practice. Further more I would like to say 'STOP BEING RELAXED AT THE AIRPORT" iF YOU CAN READ THIS CODE THEN GO AHEAD. " Coke and Pop corn will make your stomach feel full"
Man, you people are so bigoted. Try that in the US and you will soon end up in court for discrimination. U.S. and Canadian statistics distinguish between native born and foreign born citizens for certain purposes, you imbecile. 8:12 should also realize that as long as you are naturalized (don't need status) you can carry a Cayman Passport. Doesn't mean you are Caymanian. You are so right. Good for you. errr excuse me? I think you need to read the immigration law and also the meaning of naturalized. The Immigration Law law is not relevant; the British Nationality Act is what gives you BOTCitizenship and therefore the right to have a Cayman Islands passport. Caymanian and citizenship are two different things. If you have Cayman Status you are a Caymanian but being Naturalized makes you a citizen of a Bristish Overseas territory. Hence a person with Permanent residence can be naturalized but is not Caymanian. Do they resort to name calling too? Please enlighten me, for what purposes. I doubt very much for the category you are implying. Here's an idea: google is your friend. You will get scores of hits for "foreign born and native citizens" whether Canadian or U.S. In answer to your question, you have indeed missed something. There are persons who are permanent residents and hold Cayman Islands passports because they are BOTCs but are not Caymanian. Before labelling others as bigots try to educate yourself. Good Communication? lol I read this document on December 10th and was wondering how long before Cayman Press got ahold of it.. 9 whole days.